On Thursday, March 28, 2013, I officially launch my new site takisathanassiou.com (the Leadership Initiative Blog!) after a, really, long period of trials and errors, both in the area of blogging, as well and in the area of installation and operation. In this site, I will intent to integrate various articles, posts, and content, I have created in various places and was scattered all over the web. My intention is to build a professional blog, that will provide valuable content, in the areas of business, e-Learning, leadership, and productivity, covering various topics and subject, affect, directly or indirectly, these subjects. Having these thoughts in mind I decided a shift from my earlier blogging platform (Google’s Blogger) and porting the content to my new (WordPress 3.5.1) platform. My main goal was, and continue to be, to empower the people in their everyday personal and professional life, providing meaningful and readily applicable approaches, schemes, insights, interconnections and tools that I believe, can create a significant positive difference in various areas (check and my About Page). For this reason, I started the Leadership Initiative Blog, in 2012, after various blogging attempts in several platforms (WordPress, Blogger, Posterous Spaces, Windows Live, and others). I’m working for over 23 years in the IT sector, with various roles, and in these years, I have used blogs and write posts in an “indirect” mode (either anonymously, or at a corporate level, or in a distance learning environments providing blogging and micro-blogging capabilities, or for strict company promotions purposes), but only in 2012, I decide to “go public”. Until then, I had a lot of limitations, either a very demanding workload, or too much writing for work purposes, or even a lack of commitment to doing certain things, considering them as out, or at least, besides my main work stream activities. In 2011, I started some “weak” endeavors in blogging area, testing some of my ideas and scanning, browsing, reading and learning from every blogger, I thought of value. At the time, social media have been started to play a major role on the Internet, a sector I was quite literate, due to working requirements. These 2 trends, in late 2012, have started to interconnect, providing an integrated platform for communication. These trends, as well as my professional interest in business and learning technologies, platforms and tools, propagate various dormant ideas I had about developing a platform of communication, in which I would transfer knowledge I found of value. The basic structure and ideas for the Leadership Initiative Blog, the ones I have used in my earlier blog, have not been changed, and are reflected in mind map I have developed! (if you are interested, you can download the full mind map in pdf format and the corresponding mind map, which developed with the software XMind). Following this basic design and my suggestions, I decide on creating a self-hosted blog with my own domain name. As host provider, I select GoDaddy.com, after evaluating many host providers and selecting the best ones for my blogging platform (WordPress). For the selection of this service, I used the same method of selection for services and applications, presented, in a previous post. According to this approach, I select a domain and host provider (GoDaddy.com) and build my blog on WordPress 3.5.1. I use a professional responsive theme from 8BIT, LLC, the Standard Theme (now I use the Get Noticed! 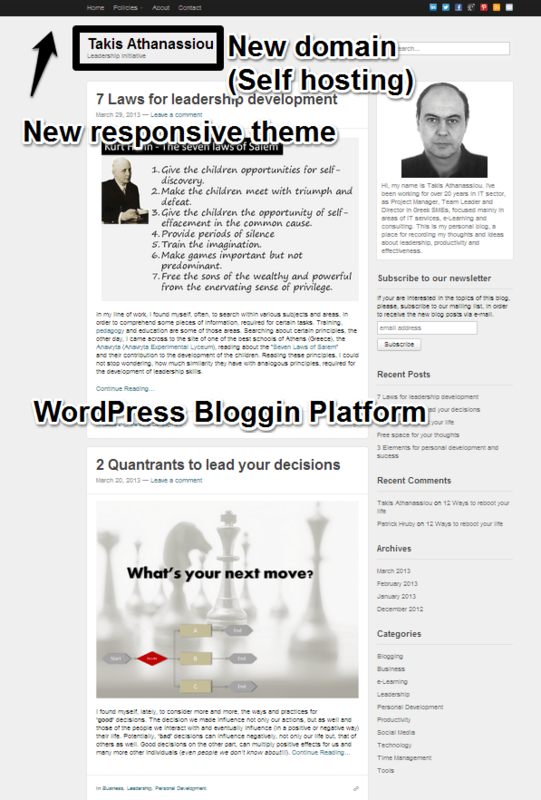 Theme for WordPress). In this infrastructure, I add only a handful, necessary, I think, WordPress add-Ins (the list are not yet concluded, I still test some, add or remove others …). Later, I integrated various third-party services I have been using and in my earlier blog, believing that provide value-added services. Most notably Disqus for integrating comments, FeedBurner for RSS subscription, and MailChimp for users subscription and newsletter management. Finally for server tasks and traffic monitoring, I use GoDaddy tools, Google Webmaster Tools and Google Analytics. Of course, my site is not yet finished. I considered it to remain in a semi-finished status, since, “under the hood“, a lot of things happening. I still trying to customize, some aspects of the theme used, to use more effectively the plug-ins I choose, to add more or remove the redundant, etc. If you like the new Leadership Initiative Blog, please share it with your friends. If you have questions or want to share your thoughts, you use the Contact page of this blog or my contact points, located on my About Page.